A Smart City is an idea of providing citizens a much friendlier urban space by using digital technologies to improve environments and decrease urban costs and energy consumptions. In recent years, as the Internet used widely, data sharing and publishing has become one of the top priorities for government sectors and private enterprises. With open data accessing, decision makers from domains can be well-informed with sufficient and real-time information and make the best decision. By integrating information from domains, including traffic, energy, public health, water resources, and so on, we will be able to fulfill an efficient City. Therefore, building a data sharing platform integrating all the information will be a key step in establishing Smart City. In addition to data integration and sharing, data visualization is also highly valued. To visualize data and make them look more realistic, the analytical models in many domains like hydrology, engineering, and airline planning, has applied 3D technologies in data visualization. However, due to difficulties of 3D data accessing and maintenance, the development of 3D data displaying and analyzing in GIS is relatively slower than those in other domains. 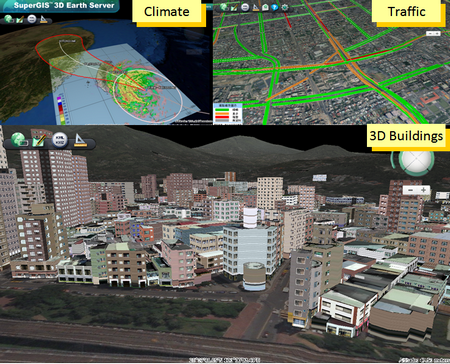 Therefore, sharing the 3D GIS data will also play an important role in 3D GIS development. The Ministry of the Interior in Taiwan built TGOS (Taiwan Geospatial One Stop), a 2D/3D GIS platform using SuperGIS Server and SuperGIS 3D Earth Server, for integrating and sharing information. SuperGIS Server enables website administrators to integrate various GIS data and publish them as many GIS services, including map services, feature services, OGC services, and so on. 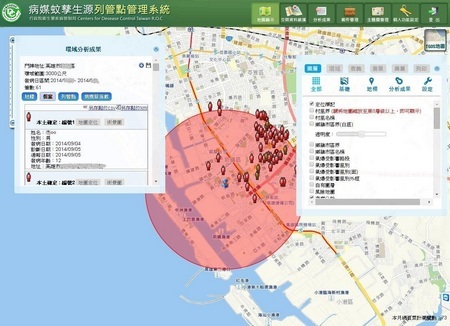 Tested by Taiwanese government, SuperGIS Server has been proved to be able to provide persistent stable services under a high-pressure environment. And SuperGIS 3D Earth Server can publish the GIS data as 3D globe services and visualize data in 3D space, allowing users to better understand the built environment. All the GIS services published by both products can be integrated with other online GIS resources. The TGOS platform integrates many GIS information, including historical satellite images, urban land-use map, locating services, and 3D models, allowing users to access the 2D and 3D data from various client-end applications. Also, it provides diverse APIs for developers to integrate the TGOS map with their own online maps. Therefore, it becomes a highly ideal platform for people to get and share information. The objective of this application is to show areas that are potentially involved in natural disasters, like floods, tsunami, landslides, and so on. A locating service is also provided for users to quickly find nearby threats, and take the necessary actions in advance. This application publishes all real-estate prices with a map of Taiwan, providing the publics with plentiful references before they buy or sell a real-estate. 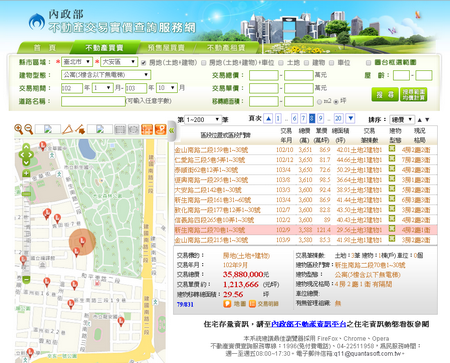 It has become one of the most popular map website in Taiwan. To control the epidemic of dengue fever in Taiwan, surveyors of the CDC in Taiwan locate the latest disease location and publish the data to this system everyday. Therefore, the authorities can easily see the distribution of the disease on the map and make strategies for disease preventions. In addition to the 2D map applications, 3D map applications will be released this year, too. TGOS now provides the 3D APIs which allow developers to display their GIS data and models in 3D environment. What’s even better is that all the 2D GIS data provided by TGOS can also be applied to 3D. All the environmental information like climates, traffics, and urban buildings can be better represented through this 3D Smart City. Data sharing and publishing is a key step to build the Smart City nowadays. 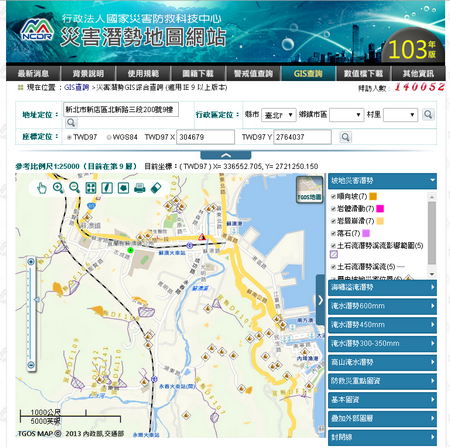 The ministry of the Interior in Taiwan has achieved this important milestone by building the TGOS map platform. The platform has been used to develop various map applications, including disaster management, urban planning, traffic control, public health, education, etc. This year, there will be TGOS 3D APIs for developers to build a realistic 3D environment and fuse all of their 2D GIS data automatically on the 3D map!